Steven Grable, an American Christian war veteran, has a big heart for Israel and the Jewish people. He recently contacted Karmey Chesed, a small Israel-based charity known for its big heart, in order to include the organization in his will. 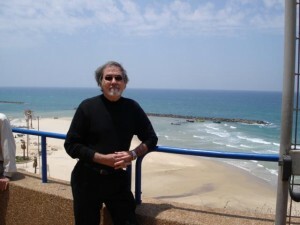 "I am a retired Vietnam war vet living in Florida," Grable explained to Breaking Israel News. "I am finalizing my will and wanted to do something for God's children in Israel. So I am including Karmey Chesed in my will as a benefactor." Grable is a retired businessman who became a born-again Christian about 35 years ago. Through his connection to God and his strong belief that God wants people to help the Holy Land and its people, Grable sought an Israeli organization which helps the poorest of poor in the country. The Hebrew words Karmey Chesed literally translate as "vineyards of kindness". The organization provides a cluster of services for needy Jewish families, Israeli soldiers, the elderly, olim (immigrants), and others in Israel. "I have read several articles on Breaking Israel News about Karmey Chesed helping the most destitute people in Israel: mothers of large families, soldiers, Ethiopians and more," he told Breaking Israel News. "I felt in my heart that I wanted to join in this mission." Grable said that he has studied the Bible for thousands of hours over the years which led him to recognize the holiness of helping people in Israel. Through his desire to support Holy Land causes, he purchased 8,000 shares in Zion Oil and Gas. He believes that Israel is on the verge of finding large supplies of these commodities and that these shares will have a significant market value to help Karmey Chesed with its holy work. "There are two big dreams that I have for the Promised Land," Grable shared. "Firstly, if the Lord sees fit, I would like to build residential housing for the elderly and Holocaust survivors in Israel. Secondly, I would like to help Karmey Chesed continue the great work that they do." Grable has written extensively on the web about his Bible studies and beliefs. He belongs to an intercessory prayer group which regularly prays for the welfare of Israel, its citizens and the success of Prime Minister Benjamin Netanyahu. Grable noted that there is an Israeli flag hanging on the wall of his group's meeting place and that he is responsible for leading the Biblical Shema prayer in Hebrew, which translates as, "Hear, O Israel: the LORD our God, the LORD is one". Additionally, Grable takes responsibility for bringing reconciliation between the Jewish people and Gentiles and to dispel replacement theology with Christians. He is proud to say that he is well-versed in Jewish music and Hebrew phrases. A regular reader of Breaking Israel News, he is aligned with the site's desire to see today's world events through Biblical prophecy. "I visited Israel for five weeks in 2011," he told Breaking Israel News. "I drove all through the country. I believe that prophecy is coming alive today. The Lord spoke to my heart and told me to be a champion for Zion." During that trip, Grable witnessed first-hand the extreme poverty under which many Israelis suffer. He shared that several times during his stay he was on Ben Yehuda Street in Jerusalem, a main thoroughfare, and saw the same man, day in and day out, in the same dirty white shirt. "This just broke my heart and I knew that I wanted to help by blessing an Israel-based organization that helps those who need it most," he explained. Also on that trip, Grable distributed key chains to Israeli soldiers with a heart reading, "Somebody loves you. We pray for your protection and prosperity." "Even this little loving kindness received by Israeli soldiers from us Gentiles moved them deeply," said Grable. "Unfortunately, the Jewish people are not used to the pure love that we offer God's children without wanting anything in return." Grable noted that he chose to include Karmey Chesed in his will as he was searching for a righteous man and organization in Israel to bless in this way. He believes that he is fulfilling the word of God by this generous gesture. "I am fulfilling Genesis 12:3 by remembering Karmey Chesed, â€˜Those that bless you will be blessed'. For someone who deeply loves God and knows that He has given the Holy Land to the Jewish people, it is understood that our charity comes from a deep place. It is more than charity. It comes from love." Aryeh Weingarten, Founder of Karmey Chesed, was extremely moved when he heard that Karmey Chesed was being included in Grable's will. "In Judaism we believe that planning for one's death is actually a blessing to assure a long life," he said. "We bless Steven Grable with all good in the merit of his blessings to sustain Karmey Chesed. In the meantime, we are praying that people will generously donate to our organization today as the needs of the poverty-stricken in Israel are constant."